Without reservations, Ensemble Modern realized sound ideas which occasionally seemed bizarre, combined in an odd way with very traditional attitudes, some of them religiously coloured. RUANG SUARA – meaning ›soundscapes‹ in English – is a joint project of Ensemble Modern, KfW Stiftung and Goethe-Institut Indonesia and is supported by the cultural foundation Kulturstiftung des Bundes. Composers and musicians from Indonesia meet Ensemble Modern. The joint project ›Ruang Suara‹ (›Soundscapes‹) of Ensemble Modern, KfW Stiftung and Goethe-Institut Indonesia brings composers and performers from Indonesia together with Frankfurt’s Ensemble Modern in several steps. 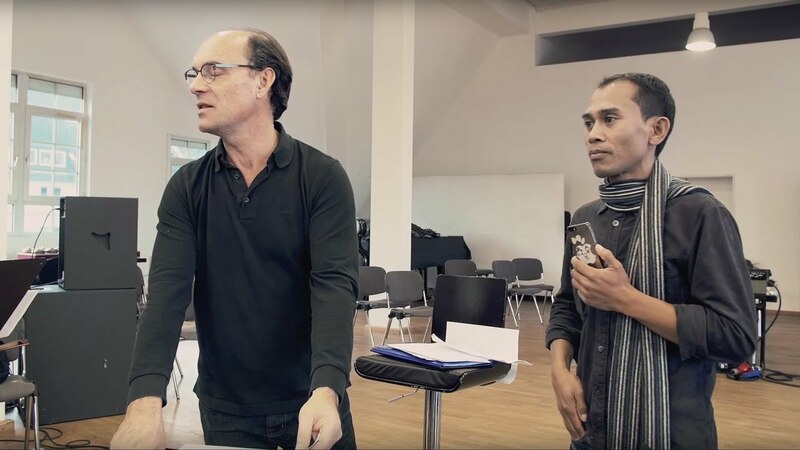 October 2014 saw a workshop of several days in Jakarta, during which composers and artists from Indonesia worked with Ensemble Modern and composers Johannes Schöllhorn and Manfred Stahnke. Together they experimented with Western and Indonesian instruments, exchanging views about different notations, tuning systems and musical concepts. The eight select Indonesian composers Dewa Ketut Alit (Ubud), Muhammad Arham Aryadi (Jakarta), Risydul Malik (Jakarta), Gatot Danar Sulistiyanto (Yogyakarta), Stevie Jonathan Sutanto (Jakarta), Gema Swaratyagita (Surabaya), Muhamad Taufik (Jakarta), Joko Winarko (Surabaya) were subsequently invited to a workshop in Frankfurt in January 2015 and commissioned to produce pieces specifically for Ensemble Modern, which were premiered at Frankfurt LAB in October 2015 and presented afterwards in Indonesia (Jakarta, Yogyakarta, Bandung). Dewa Ketut Alit plays with harmonies and rhythms based on an elaborate development of the Balinese gamelan and transposes these experiments onto Western instruments. In their compositions, M. Arham Aryadi and Stevie Jonathan Sutanto augment the instrumental performance of a mixed ensemble of Western and Indonesian instruments with electronic and audio-visual elements. Joko Winarko combines scenic action with rhythms and melodies from the gamelan tradition and in doing so, also reflects the traditional Indonesian unity of theatre, dance, instrumental music and song. Ris Banbos likewise combines ensemble music with songs, dances and instrumental melodies by other participating composers. An interest in new types of sound and the body language of musicians plays a major role in the works of Taufik A. Adam, Gatot Danar Sulistiyanto and Gema Swaratyagita. Their various artistic approaches not only reveal different backgrounds, experiences and types of education, but also demonstrate a very conscious handling of their own tradition. In a lively exchange between composers and performers, complex contexts are created that transcend cultural and artistic boundaries: a multi-cultural dialogue of art forms in which music is the host. The internationally acclaimed Anglo-Ethiopian video artist Theo Eshetu has been commissioned to capture this intercultural musical rendezvous on film. His experimental documentation RUANG SUARA: SOUNDSCAPES offers insights into the workshop in Frankfurt. The short film will be shown before the concerts.